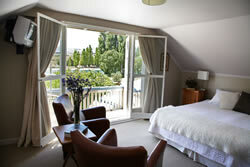 The guestrooms all command stunning river, mountain and garden views. 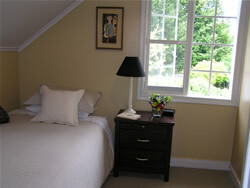 Privacy and full home comforts are assured and provided. The two double rooms have their own balconies, and TV's (FreeView). 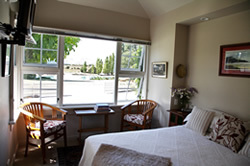 This spacious king/twin room has double doors opening onto a balcony with river and mountain views. The comfortable chairs and tv will make your stay in this pleasant room rewarding. This room has a private bathroom. If you have a party of 3 adults, or 2 adults and a child then you have the entire upstairs which is comprised of one king/twin room (see photo above) and a single room (see photo alongside). This room has a verandah, comfy chairs and tea & coffee making facilities. 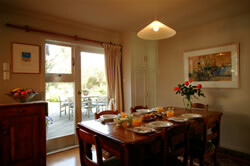 It also boasts uninterrupted river and mountain views with immediate access to the river. It has an ensuite bathroom and a private entrance.